Linagliptin (BI-1356) is an oral DPP-4 inhibitor drug for the treatment of type-II diabetes. The drug was launched under the trade name Trajenta in the EU. Dipeptidyl peptidase-4 (DPP-4) is a protein that plays a major role in the degradation of GLP-1 and GIP. Linagliptin (BI-1356), which is being marketed under the trade name Tradjenta®, is an oral dipeptidyl peptidase-4 (DPP-4) inhibitor drug for the treatment of type 2 diabetes. Developed by Boehringer Ingelheim in partnership with Eli Lilly, the drug reduces the blood glucose levels in diabetic patients. A marketing authorisation application for the drug was submitted in the US, the European Union (EU) and Japan in the second half of 2010. Tradjenta® was approved by the US Food and Drug Administration (FDA) in May 2011 for the treatment of type 2 diabetic patients in the US. It can be used as a single monotherapy or in combination with other drugs such as metformin, sulphonylurea and thiazolidinediones. The drug was approved by the European Medicine Agency in August 2011, and marketed under the trade name Trajenta in the EU. Linagliptin was approved in Japan in 2011 and is marketed under the trade name Trazenta. The drug has also been approved in Mexico and Brazil under the trade name Trayenta. Linagliptin was approved by Health Canada in October 2011. Tradjenta® was also approved as an add-on therapy with insulin in adults with type 2 diabetes by the European Commission (EC) in October 2012. Linagliptin in combination with metformin hydrochloride (HCl) was approved by the FDA for the treatment of type 2 diabetes in adult patients in January 2012 and is marketed under the brand name Jentadueto™. It was approved by the EC in July 2012. Diabetes is a chronic illness that results in very high amounts of sugar in the blood. It is usually caused due to lower secretion of insulin in the human body and in people with low activity, poor diet, and obesity. It may also occur due to genetic inheritance. Type 2 diabetes is the most common type of diabetes. Its symptoms include fatigue, blurred vision, and increased appetite and thirst. Gastrointestinal hormones such as glucagon-like peptide-1 (GLP-1) and glucose-dependent insulinotropic polypeptide (GIP) are released from the intestine and accumulated in the blood. These hormones enhance the production of insulin from the pancreas and therefore are involved in reducing the sugar levels in the blood. 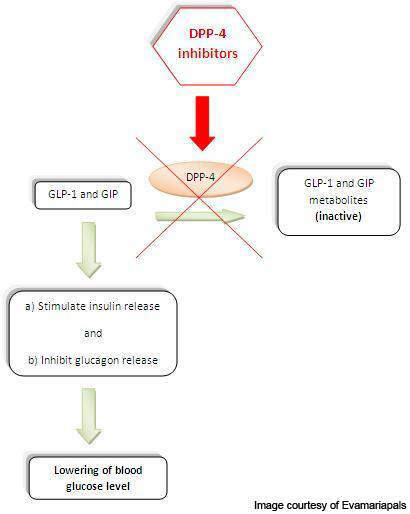 GLP-1 also inhibits the secretion of glucagon, a hormone which increases the glucose secretion in the liver. 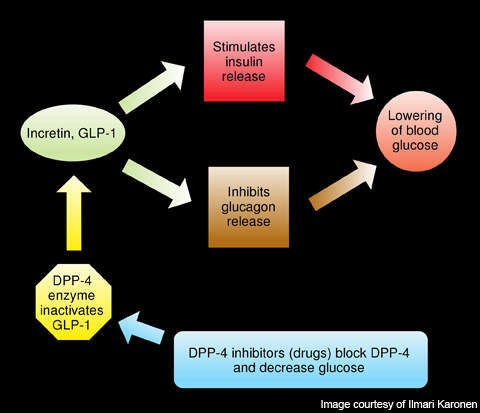 DPP-4 is a protein, which plays a major role in the degradation of GLP-1 and GIP. Linagliptin, a DPP-4 inhibitor, has unique properties with high affinity to the DPP-4. It binds to DPP-4 and inhibits its action, thereby increasing the levels and activity of GLP-1 and GIP. Phase III trials to evaluate linagliptin as a monotherapy were initiated in August 2008 and completed by August 2010. The trials were conducted on 227 patients in whom metformin therapy did not show positive effects. It was observed that linagliptin enhances the glycaemic control in type 2 diabetes patients. The trial data also supports the safety and efficacy of the drug which was already observed in Phase II trials. Phase III trials were also conducted to evaluate the safety and efficacy of the drug as an add-on therapy to sulphonylurea in patients with uncontrollable type 2 diabetes. A smaller group of patients was enrolled and administered either 5mg of Tradjenta® or placebo. Reduction in HbA 1c from baseline was observed and the drug was found to be safe and efficient, apart from a few side effects that also occurred in the placebo group. Hyperglycemia was not observed. Phase III trials to evaluate the safety and efficacy of the drug in patients undergoing metformin therapy and yet having lower glycaemic control began in October 2010 and were completed by March 2010. A Phase III trial was initiated in August 2008 to evaluate the safety and efficacy of the drug as a monotherapy or in combination with pioglitazone. A total of 2,122 patients were enrolled and were administered either 5mg of linagliptin or 5mg of linagliptin and pioglitazone 30mg. The trial data was released in December 2010, and the safety and efficacy of the drug were observed. Phase III trials were also conducted to study the safety and efficacy of the drug in type 2 diabetes patients with severe renal impairments and those with or without renal impairments. 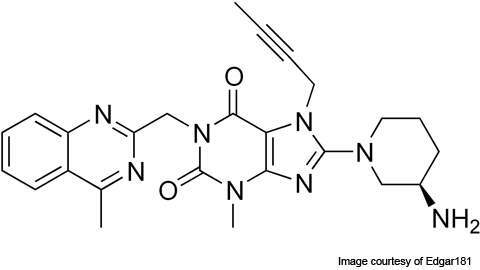 A Phase III trial to compare the effects of linagliptin to those of pioglitazone was initiated in August 2010 and was completed in February 2013. It is a 30-week study enrolling 936 patients. Results from a 102-week Phase III trial were announced in September 2011. The trial established the long-term safety and efficacy of linagliptin, as well as the drug’s ability to reduce blood glucose levels in adults with type 2 diabetes. A total of 689 patients were enrolled for a Phase IV trial in November 2011. The trial evaluated the safety and efficacy of Tradjenta in combination with metformin. The primary endpoint is to achieve a change in baseline in HbA1c after 14 weeks of treatment. In December 2011, results from a 24-week Phase III trial of linagliptin in combination with metformin were announced. Data from the trial indicated that linagliptin was able to achieve stable glucose control with a low risk of hypoglycaemia. Another Phase III study named CAROLINA is being carried out to evaluate linagliptin against glimepiride for cardiovascular outcomes. A multinational, randomised, double-blind, placebo-controlled long-term clinical trial named CARMELINA is being carried out to evaluate the safety and efficacy of the drug on the cardiovascular system and kidney outcomes in patients with type 2 diabetes at high risk for heart and/or kidney disease. A total of 6,980 adult patients with type 2 diabetes were enrolled for the study. The cardiovascular events such as cardiovascular death, non-fatal myocardial infarction and stroke were the primary endpoints for the trial. The study met its primary endpoint and the results were announced in October 2018. The long-term cardiovascular safety outcomes in Tradjenta®–treated patients were found similar to the placebo group in the trial without any new adverse effects.